Mary's troubles began six days after her birth in 1542. 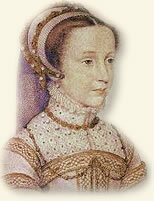 It was on that day that her father, King James V of Scotland, died and the infant was declared Queen of the Scots. She was immediately thrust into a caldron of political turmoil containing a broiling mix of the long-standing enmity between Scotland and England, the fragility of the Tudor succession to the English throne, England's rivalry with France, and the religious violence between Catholics and Protestants. As the great-granddaughter of England's Henry VII, Mary was next in line to the crown of England after Henry VIII's children - Edward, Mary and Elizabeth. The Scots attempted to remove the threat posed to Henry's succession by pledging the new-born Mary to marriage with his son Edward. This plan soon self-destructed, however, and the Scots turned to their old ally (and England's old enemy) France. Mary was sent there at age six for her upbringing and education. The 18-year-old Mary (now a confirmed Catholic) returned to Scotland in 1561 to reign as Queen of her subjects (now confirmed Protestants). Contrary to all expectations, Queen and subjects initially achieved an accommodation. However, this situation quickly deteriorated. In 1565 Mary married her first cousin Henry, Lord Darnley and gave birth to a son - James - the following year. 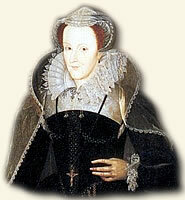 In 1567, her husband was murdered and Mary quickly married the Scottish Earl of Bothwell an action that outraged the Scottish nobility who promptly imprisoned Mary and forced her to abdicate her throne to her one-year-old son, James. The following year Mary escaped from her prison but was forced to flee across the border with England after the defeat of her supporters at the Battle of Langside, near Glasgow, on May 13. Instead of the refuge she anticipated, Mary was immediately imprisoned by Queen Elizabeth and spent the next 19 years shuffling from castle to castle while her cousin deliberated what to do with her. Mary became a lighting rod for plots and rumored plots against Elizabeth. Finally, in 1587, Elizabeth was persuaded to end the threat to her throne once and for all and ordered Mary's execution. "No, no, Madam you must die, you must die!" "On February 7, 1587, the representatives of the English Queen, reached the Castle of Fotheringay, where the Queen of Scotland was confined at that time, between two and three o'clock in the afternoon. In the presence of her jailer, Paulet, they read their commission regarding the execution of the prisoner, and said that they would proceed with their task the next morning between seven and eight o'clock. The jailer was then ordered to have everything in readiness. 'No, no, Madam you must die, you must die! Be ready between seven and eight in the morning. It cannot be delayed a moment beyond that time.' "
"Please help me mount this. This is the last request I shall make of you." "The scaffold had been erected in the middle of a large room. It measured twelve feet along each side and two feet in height, and was covered by a coarse cloth of linen. The Queen entered the room full of grace and majesty, just as if she were coming to a ball. There was no change on her features as she entered. Then she repeated to him all that she had said to him in her room about what he should tell her son. Standing on the scaffold, she asked for her almoner, (chaplain) begging the officers present to allow him to come. But this was refused point-blank. The Count of Kent told her that he pitied her greatly to see her thus the victim of the superstition of past ages, advising her to carry the cross of Christ in her heart rather than in her hand. To this she replied that it would be difficult to hold a thing so lovely in her hand and not feel it thrill the heart, and that what became every Christian in the hour of death was to bear with him the true Symbol of Redemption." "Nay, my good man, touch me not!" But she could not prevent him from touching her, for when her dress was lowered as far as her waist; the scoundrel caught her roughly by the arm and pulled off her doublet. Her skirt was cut so low that her neck and throat, whiter than alabaster, were revealed. She concealed these as well as she could, saying that she was not used to disrobing in public, especially before so large an assemblage. There were about four or five hundred people present. The executioner fell to his knees before her and implored her forgiveness. The Queen told him that she willingly forgave him and alI who were responsible for her death, as freely as she hoped her sins would be forgiven by God. Turning to the woman to whom she, had given her handkerchief, she asked for it. She wore a golden crucifix, made out of the wood of the true cross, with a picture of Our Lord on it. She was about to give this to one of her women, but the executioner forbade it, even though Her Majesty had promised that the woman would give him thrice its value in money. After kissing her women once more, she bade them go, with her blessing, as she made the sign of the cross over them. One of them was unable to keep from crying, so that the Queen had to impose silence upon her by saying she had promised that nothing of the kind would interfere with the business in hand. They were to stand back quietly, pray to God for her soul, and bear truthful testimony that she had died in the bosom of the Holy Catholic religion. One of the women then tied the handkerchief over her eyes. The Queen quickly, and with great courage, knelt dawn, showing no signs of faltering. So great was her bravery that all present were moved, and there were few among them that could refrain from tears. In their hearts they condemned themselves far the injustice that was being done. The executioner, or rather the minister of Satan, strove to kill not only her body but also her soul, and kept interrupting her prayers. The Queen repeated in Latin the Psalm beginning In te, Damine, speravi; nan canfundar in aeternum. When she was through she laid her head on the block, and as she repeated the prayer, the executioner struck her a great blow upon the neck, which was not, however, entirely severed. Then he struck twice more, since it was obvious that he wished to make the victim's martyrdom all the more severe. It was not so much the suffering, but the cause, that made the martyr. Saying this, he stripped off the dead Queen's head-dress, in order to show her hair, which was now white, and which she had been afraid to show to everyone when she was still alive, or to have properly dressed, as she did when her hair was fair and light. It was not old age that had turned it white, for she was only thirty-five when this took place, and scarcely forty when she met her death, but the troubles, misfortunes, and sorrows which she had suffered, especially in her prison." The account of Pierre de Bourdeille was originally published in 1665 and republished many times thereafter. This account appears in Snyder, Louis (ed.) A Treasury of Intimate Biographies (1951); Fraser Antonia, Mary, Queen of Scots (1969). 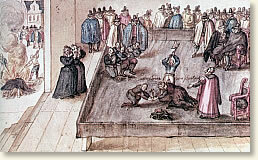 "The Execution of Mary, Queen of Scots, 1587," EyeWitness to History, www.eyewitnesstohistory.com (2005). Mary's son became King James I of England with Queen Elizabeth's death in 1603. In 1612 he had his mother's body exhumed and reburied in Westminster Abbey where it remains today.